Use this cover letter example if you are going to apply for a Community Nurse job in the UK. Please find enclosed my CV in response to the vacancy advertisement in Learnist.org for a Community Nurse in London. During my nursing career I have worked as a Medical Nurse and Community Nurse. As you will see from my CV, for the past 5 years I have been a full time mother and housewife and have therefore been out of the workplace for this time. My children are now in full time education and I am looking for a challenging job role to get me back into work. I would love to have the opportunity to discuss the possibility of a future career with your organisation and look forward to hearing from you. 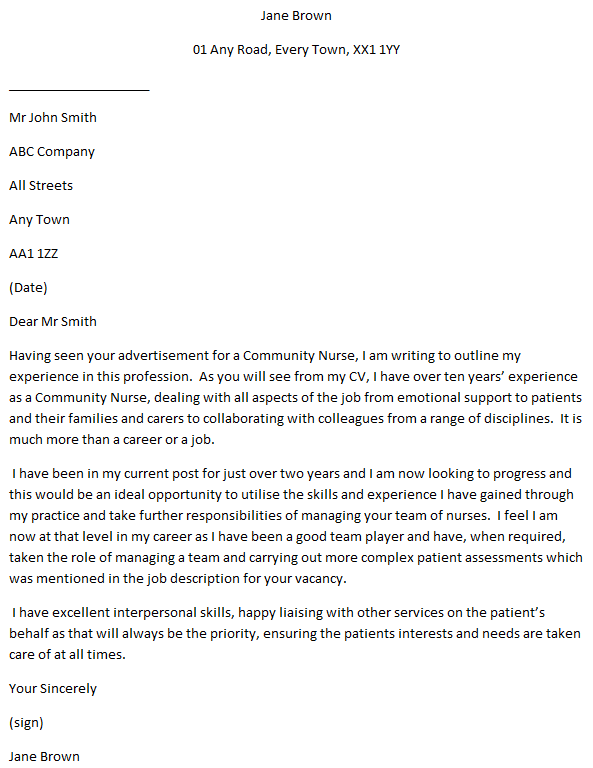 Having seen your advertisement for a Community Nurse, I am writing to outline my experience in this profession. As you will see from my CV, I have over ten years’ experience as a Community Nurse, dealing with all aspects of the job from emotional support to patients and their families and carers to collaborating with colleagues from a range of disciplines. It is much more than a career or a job. I have been in my current post for just over two years and I am now looking to progress and this would be an ideal opportunity to utilise the skills and experience I have gained through my practice and take further responsibilities of managing your team of nurses. I feel I am now at that level in my career as I have been a good team player and have, when required, taken the role of managing a team and carrying out more complex patient assessments which was mentioned in the job description for your vacancy. I have excellent interpersonal skills, happy liaising with other services on the patient’s behalf as that will always be the priority, ensuring the patients interests and needs are taken care of at all times. I believe that my work experience and particular skill set make me a strong candidate for a role within your team and I am fully available at your convenience to discuss the added value that I can bring. I have attached my CV for your information. Please do not hesitate to contact if you require further information. I look forward to hearing from you in due course.